A couple of years ago, I wrote a lengthy post about the vintage synth market, which at the time seemed to be hitting something of a peak. Flash-forward two years and, well, vintage synth prices continue to increase, even as more and more excellent analog models get released every year. While there has been some leveling off for certain models and eras (original Moog Model Ds, for instance, have been pretty stable since 2017), prices on many of the most recognizable and in-demand synths of the '70s and '80s continue to rise. For the average vintage synth enthusiast, though—where the idea of buying a Jupiter or CS-80 doesn't even register—this continued vintage surge has been perhaps most apparent in the realm of the original Roland Juno series of the 1980s. 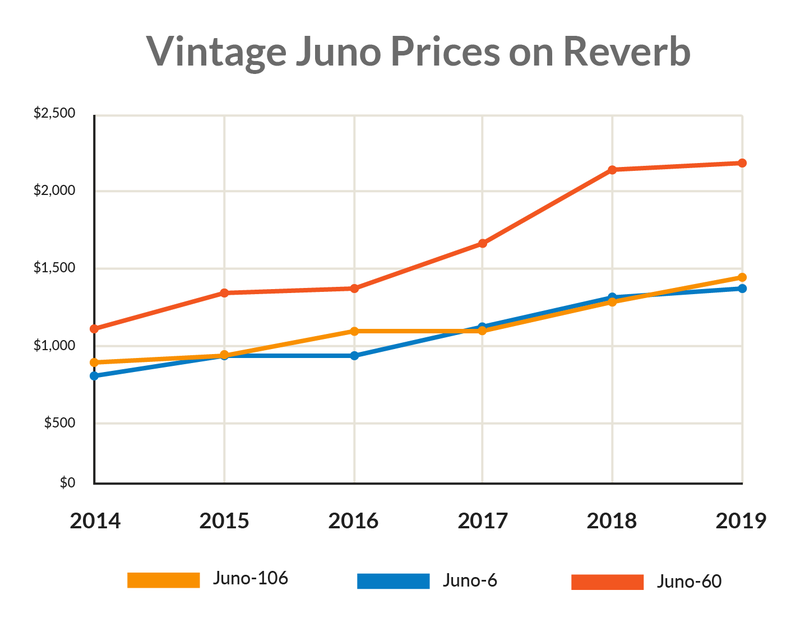 As you can see in the graph below, prices on the three classic Juno models—the Juno-6, -60, and -106—have steadily increased in price essentially every year over the past five years on Reverb, with the Juno-60 in particular rising significantly since 2016. The averages shown in this graph come from sales on Reverb and do not include any sales for non-functioning or poor condition units. While Reverb's numbers may not be reflective of the synth market at large as found on other sites, local sales, or in stores, the data still shows an undeniable upward trend in this segment. Of course, people bemoaning the climb in vintage synth prices is not a new thing on this internet of ours, and it's not even a new thing when it comes to '80s Junos. When looking at pricing on other '80s synths or vintage Rolands more generally, however, the recent increases in this segment have been especially pronounced, which is enough, in my mind, to justify a more specific investigation. A ton has been written over the years about the legacy and character of the Juno line, and for more on that, you can check out this recent post from Attack Magazine, along with a massive library of demos, tributes, and shootouts on YouTube. There's also this recent Roland history doc from our pal Alex Ball, which does a fine job placing the release of these instruments into a historical context. In summary, what makes the Juno so appealing breaks down along a few key lines. First, these synths sound great. They don't sound great in a generic, overriding way. They sound great in a highly characteristic, Roland-as-the-sound-of-the-'80s way. There is a Juno sound and, while many replications and alternatives exist, if that's what you're after, an original artifact does it best. Second, these synthesizers are extremely approachable. Their layout is intuitive and essentially teaches subtractive synthesis as part of the experience. Anyone can make these synths sound good, and in a studio setting, their simple, no-fuss control set means you can easily patch in something usable and musical on the fly. Other frequently cited features that play into the Junos' appeal include the genre-defining Roland chorus section as well as a reputation for reliable tuning compared to other synths of this era, which comes from the use of then-innovative digital controlled oscillators (DCOs). This same feature is what allowed the Junos to be some of the first affordable polyphonic synths, distinctly separating them from the keyboards of the previous decade. 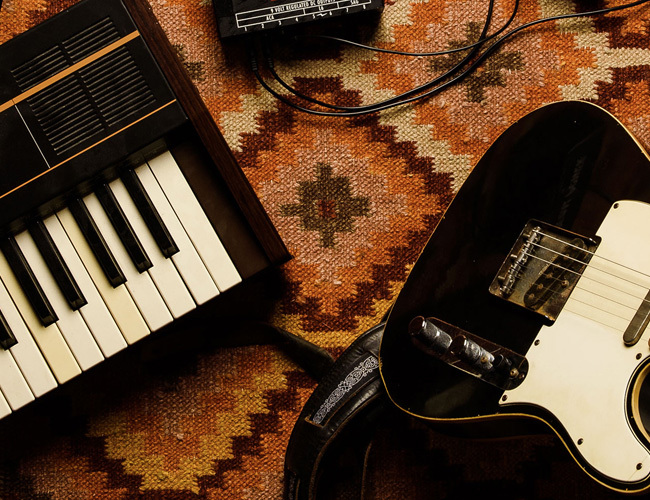 Much has also been written and debated about the difference between the three models, but to cover just the most cursory basics, the Juno-60 replaced the original Juno-6 in 1982 and added patch memory and external control via Roland's DCB protocol. 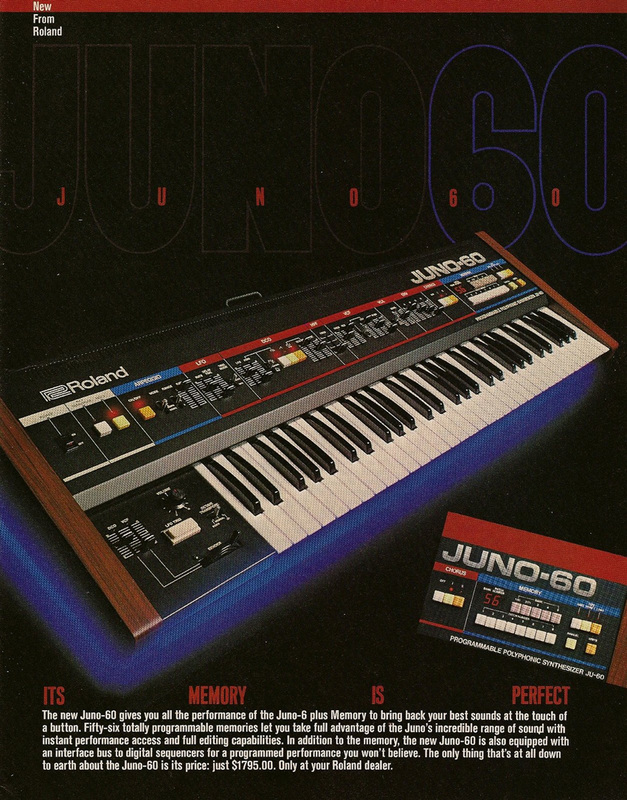 The Juno-106 came out in 1984 with a few additional tweaks, including doubling the number of presets while adding portamento and, most notably, MIDI. There are some other internal changes between the first two and the -106 especially, and many devotees claim that the -60 delivers the most aggressive or distinctive sound, which may contribute to it claiming the highest prices. The Juno-60 and -6 also include a delightful arpeggiator that is not found on the -106. As you can see in this second graph, the -106 model, which was the most widely produced in its day, remains the most frequently traded. Here, we've also included combined sales numbers for the small-format Alpha Juno models, where pricing has remained surprisingly consistent over the past five years. It's reasonable to think that these two are bound to start climbing as the big-brother Junos become less attainable. 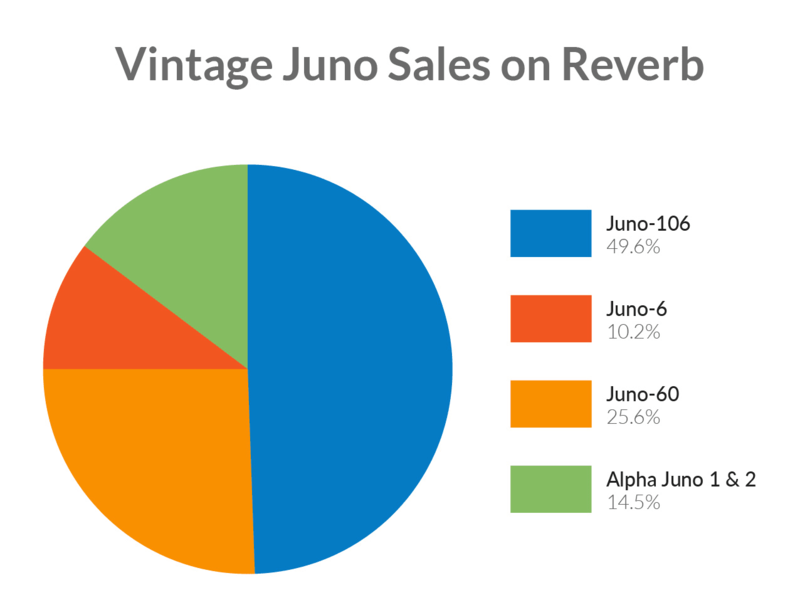 While there were more 106 Junos produced than the earlier -6 and -60, the numbers we're showing in this graph are for all used sales on Reverb, which may include the same specific unit trading hands multiple times. Someone who buys a Juno-106 and resells it two years later would add two sales to the Reverb database while only moving one actual synthesizer in the process. The sounds (and gear) of the 1980s remain extremely influential in today's pop and electronic music landscapes, and while the Junos get name-checked less than their 808 cousins, you still hear their tones in an endless procession of chart-toppers from the likes of Bruno Mars, and a who's who of dominant DJs and dance producers. And that's all in addition to the basically endless list of artists who used the Juno line in its '80s heyday. As their reputation as a foundational ingredient in modern pop textures persists, it could be that the producers and studio pros of the world see the addition of a Juno as an expected and necessary fixture. It's a spice you need to have in the kitchen for those "this could really use a Juno" moments. A Juno-60 sits prominently in this video for Animal Collective's "My Girls." But the artist connections to the Juno series go well beyond pop and Top 40, of course. Sonic spelunker Daniel "Oneohtrix Point Never" Lopatin has described his trusty -60 as his "Lucille," and Junos can be heard in the work of scruffy rock favorites like Mac DeMarco and Tame Impala (for more of their synth sounds, check out this and this post by our friend Reverb Machine). The Juno has become a go-to choice for the bedroom producers of all genres and has been fundamental in synth pop, synthwave, and any number of other genres with the word "synth" or "wave" in the heading. Stranger Things might also come into play here. And perhaps less important but also obvious, Junos look cool. The Instagram-friendly nature of their bright colors and wooden side paneling (on the earlier models anyway), means that these synths show up all over the place, only adding to their recognizability, mystique, and the associations people make with these instruments. It may not seem like as big of a deal, but the near-universal artist usage of these synths combined with their familiar iconography make Junos as much desired cultural artifacts as they are musical instruments. The aforementioned leveling off on Moog Model D prices has one very obvious explanation: Moog reissued the Model D between 2016 and 2017 to general acclaim and quick sales. While certainly in a different subsection of the synth market, the Behringer Model D clone too has expanded the availability of this style of synth. Model D supply has gone up, and, logically, vintage prices have come down. Comparatively, Roland has never released an exact reissue of the classic Junos, save for the digitally emulative Boutique Series JU-06 Module which has experienced a similar escalation in price since being discontinued. Roland and plenty of other software companies have also released Juno-emulating VSTs over the years, such as freely available TAL U-No-62, but again, that doesn't really factor in for most people seeking out a tactile hardware synthesizer. There have been plenty of Juno-like synths released in recent years, such as the Behringer DeepMind 12 and, to a certain extent, the Korg Minilogue, which also presents an extremely approachable subtractive interface. There's also the modern Roland Juno line that kicked off in 2005 with the Roland Juno D. These digital workstations, while a good value, share little with their forebears beyond the name and a general marketing angle of being widely available keyboards for gigging musicians. This all leaves the original Junos in a class of their own that has been at least comparatively isolated from the latest era of reissues and replications. We'll see if Uli Behringer has anything to say about that soon, I'm sure. Whether it's synths, guitars, saxophones, or recording consoles, anyone who buys and sells vintage gear knows this pattern well: You buy something for $X and add $Y worth of parts and repairs to it, and then when the time comes to sell it, you expect to recoup at least the sum of those two figures. While often people eventually settle for lower final sale prices, this dynamic clearly works to establish some floor of resale prices over time. Lots of people who traffic in gear also expect to earn some gains when holding onto something with consistent demand or at least keep pace with the rate of inflation. This cost of maintenance and the effect that has on resale prices is especially noticeable in the case of the Juno-106, which has a famous fault in its resin-covered voice chips that require repair or replacement through their lifetimes. There are also a number of popular mods and improvements that Juno owners can invest in. For instance, the much-touted Juno Kiwi-106 mod offers a bunch of upgrades, such as a more modern integration options, expanded memory and control. Whether it's paying for a set of replacement chips or otherwise upgrading a Juno, these common practices have a direct role in elevating prices over time. There are, as always, factors beyond the immediate appeal of or demand for a particular piece of used gear that can have a significant impact on used prices, and macroeconomic forces like recessions and shifts in consumer confidence can move gear markets more drastically than our quaint musical tastes. The modern era of online sales via sites like Reverb, eBay, synth forums, and Facebook groups has also given people a much-heightened awareness of market values, in addition to a global market of potential buyers, so the possibility of people selling these on the cheap has grown even slimmer. Note: In anticipation of the comments we usually get on these sorts of posts, I just want to note when we publish things like this, we're absolutely not trying to push the market one way or another. We're just showing everyone some data we think is interesting. When it comes to distinct historical artifacts like the Junos, a common debate centers on to what degree players seek these instruments as the result of collectability and historic fetishism versus function and musicality. This outlook typically concludes that prices on these instruments will continue to climb as their mystique is perpetuated and the entropic nature of delicate vintage synthesizers further diminishes the supply of synths in good condition. While someone looking to achieve Juno-like sounds is spoiled for choice today, that's not really the point. Maybe they've wanted a Juno since childhood and can finally afford one, or maybe they've just caught that vintage bug and have been pointed in this direction by the Junos' perpetual reputations as all-time classics. There are a lot of reasons different people want different pieces of gear, and the idea that certain vintage synths are becoming overpriced is, of course, relative. Relatedly, when thinking about these sorts of numbers, it's also worth noting how these prices compare to how much these units sold for upon their original release. A 1983 ad for the Juno-60 lists its "down to earth" price at $1,795 USD, which, according to most inflation calculators, puts it at around $4,500 in today's dollars. Inflation rates and buying power are complicated topics, but the back-of-the-envelope calculation means that the original prices were considerably higher than where they currently stand. And consider that today's synth market is one where building even a modest Eurorack system is going to cost as much as a Juno-106, while many new analog models that follow the Juno legacy carry similar or higher prices. Taken in this context, maybe an original Juno, even amid the recent upturn, isn't such a bad deal after all. Feel free to prove me wrong in the comments. Is the Vintage Synth Market Heading for a Downturn? Why Are These 5 Reverb Listings So Expensive?